Kim Verhage went into Reading Books with a friend one time in 1985, and the friend had to leave to pick up her daughter. Kim started talking to the owner and never really left (for good) again. After that first visit she began working for the owner in exchange for books and within months had made an offer on the business. Thirty years later, she now has announced that she has sold the property and will be closing her doors at the iconic Rockford business. Bookstores really don’t sell, she said of the decision to close her doors, although business has been good the entire 30 years she has made bookselling her livelihood. Even the advent and popularity of tablets, Kindles and the Internet have not put much of a dent into readership of real, paper books. Kim said, surprisingly, it is mostly the older readers, senior citizens, who tend to read books electronically. Younger folks, those thirty and under, remain users and buyers of traditional formatted publications. Verhage decided she would like to close her doors, continue her fight against her third round of breast cancer and perhaps travel the country. She has beaten the cancer twice, in 2011 and in 2015, and has good prospects of beating it again, but has decided closing her doors is a better alternative than an on again, off again schedule for the store. Kim always loved books, and used to visit First Folio, an antiquarian bookseller, in downtown Grand Rapids when she was an official for the United States Census in 1980. ‘Mostly I used to go in and touch her books everyday,” she said. It was the first used book store she’d been in. She loved it. Fast forward to her visit to Reading Books, which was in part of the building complex it fills now, with an adjacent train museum. The train car came from New York City and New Jersey, where it functioned as a commuter coach, a 1926 Stillwell. The caboose was a 1926 Grand Trunk caboose that sat for years in a field north of Rockford before being added to the car. The owner then was the late Bill Meier, who had train memorabilia on the cars. They were put in their present location by train, being lifted off the tracks that used to be on the Fred Meijer White Pine Trail into the store’s unpaved parking lot in 1974. The lot was wet and muddy and when the crane moved the train car from the lot to the section of track where it is today installed, the weight of the train car made the crane sink down in the mud, upsetting the whole operation. When Kim moved in in 1985, the building, located at 27 S. Squires Street, was a gift shop on one side and a pet shop on the other. The bookstore was in the train and expanded into the other spaces as tennants moved out and the store expanded. Today the bookstore fills the entire lengths of all the connected spaces and houses more than a 100,000 book inventory. From now until she closes the doors on Reading Books for good just after this year’s Start of Summer Celebration, books are half off. At the time Kim married her late husband Rick, who had two children from a pervious marriage and they had their son, Scott, together. Scott was just one year old when she bought the business and then the property, and literally grew up in the store. “I went from being single to being a wife and mother of three in one year,” she said. And owner of a business, a tough balancing act for any young mother. “We had a play pen in the center aisle,” Kim described. She said her more senior customers were at a time in their lives when their grandkids were grown, so they had no babies in their lives to hold. There was a rocking chair in the store and they would hold and rock Scott as an infant. Scott is now grown with his own successful career and approves of Kim closing the doors. “He wants me to stop working and take care of myself,” she said. Kim believes good times are in store for downtown Rockford and sees people moving in the area like crazy. Online sales have hurt everyone, it seems, but she knows her customers, at least, appreciate the physical visit to a bookstore and the relationships between store owners and their customers. She has seen big changes in downtown Rockford, and has worked quietly, but persistently to improve one aspect of it seemingly ideally fitting for a bookseller. Note, booksellers are notorious for having fond relationships with cats, to the point that it is the norm, rather than not, for booksellers to have cats in the shop. 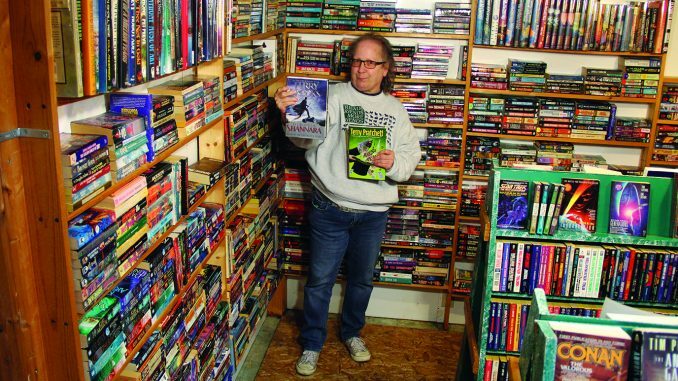 Reading Books is no exception, but when Kim purchased the business, it was in the midst of a feral (wild domestic) cat colony, a persistent problem that plagued downtown Rockford for ages. The Squire Newspaper at the time was located where Peppermill Grill is now, and the Squire’s Alice Allen, wife of the late Roger, teamed up with Verhage to take on the challenge. The women had a program of trapping the feral cats and having them spayed and neutered. Kittens were caught and homes were found for them. It was a tough problem that can build up again quickly when people dump kittens they don’t want. Over the years Verhage guesses she has caught and spayed or neutered hundreds and hundreds of cats. If you visit now, see a quartet of grown littermates that live around the store. The animals are shy, but healthy. If you look at their ears, you can see the ends of one of each of the cats ears are clipped, the vets signature that a feral cat has been spayed or neutered. Kim calls the program CNR (Catch, Neuter and Release). Coit Animal Hospital donated the surgeries at cost to help out. Kim said it is beneficial to allow the grown feral cats to stay, as they are territorial and won’t let new, unneutered animals to move in. The colonization of feral cats is one that perpetuates as irresponsible pet owners allow their animals to breed unwanted litters. “There was just a colony on Prospect Street,” she noted. While she was sick from her first cancer, someone dumped off the four cats there now. By the time she was recovered from her chemotherapy, those cats had grown, had litters and their litters had had litters. In a short time the original feral population had grown. By the time Kim caught and released or found homes for the animals, she had had 75 cats spayed and neutered. She said the new owner of the property told her the cats can stay and a friend will care for them. “Cats go feral so fast. A kitten may have been born in a household and be tame, but when it gets dumped, it won’t go up to a stranger,” she said. So impressive were her efforts to solve this problem of others’ irresponsibility and disregard for the quality of life of unwanted pets, The Grand Rapids Press wrote articles about her work. The book business has changed over the last three decades, from the popularity of different genres to how people read. Hot now are Urban Fantasy and Paranormal genres. Kim herself has changed what she likes to read. She used to be unappreciative of Romance novels, but certainly changed her mind. Nora Roberts is a wildly successful author of Romance, and according to Kim, any three best sellers after her don’t sell half what she sells. It gave Kim a new appreciation for the genre. Later, she was watching a television show about Romance, and it included men dressed in costumers reading from Romance books. It made her mad and challenged her. She pulled a Romance book from her shelves, the first in a trilogy, and decided to read it. By midnight she’d finished the book, woke her husband up and sent him down to the store to pick up the next two books of the series. “I already knew the Romance readers were my favorite,” she said. “They were the best, the brightest, they read the most. One was a federal judge and she asked that person to help her understand Romance better. There is a formula to the genre that is vital. No matter what else the plot line, the couple is monogamous after they meet, even if they are not at first romantically connected, and there is always a happy ending. The newer fictional categories of Urban Fantasy and Paranormal Fiction are super hot right now. The line between the two have become somewhat blurred, but in general in Urban Fantasy the setting is the world we live in now, but with magic, creatures like vampires. She sites authors Jim Butcher and Charlene Harris as among those writers and said the stories aren’t gory or bloody, like Horror. She also likes and recommends thriller, suspense novels, mysteries and true crime. True crime can be kind of hard to take, but in Kim’s case, close to home. “They are good preparation if the FBI is going to use you to play games with serial killers,” she said. Long time residents will remember Kim’s involvement in the story of Marvin Gabrion, on death row for murder. He was convicted of killing 19 year old Rachel Timmerman, of Cedar Springs, in 1997 and has been on death row for decades. Missing with the teen girl was her 11 month old daughter, Shannon, Kim’s granddaughter. This year marks the twentieth year since Timmerman’s murder, and Shannon would be 21 years old now, if she were alive. Kim was heavily involved with the FBI during the case and the early years of Gabrion’s incarceration. Rachel was drowned on federal land in Newaygo, tied to cinder blocks and thrown off a rowboat into a lake, where she drowned. She had left home with her daughter and was missing for a month before her body was found. There has never been any evidence of the missing baby, and Gabrion has refused to disclose what happened to the child. The killer used to write letters to Kim, taunting her that he could clear the record if she cooperated with him. The FBI used Kim and the correspondence to try to elicit evidence or clues from Gabrion. Nothing worked in the end. There have been a number of crime shows describing the story of this killer, who is suspected of multiple murders. He fled this area and was eventually caught in New York where he was collecting Social Security checks from several men who went missing and were never found. FBI Criminal Pursuit filmed a story about Gabrion in Season Three, Episode Three, called The Undertaker. Kim said it can be found on Youtube. She participated in countless efforts to find Shannon, find clues to her fate, or ask the public to call authorities if they know anything. The interactions with Gabrion were nearly unbearable, the countless interview for stories, television shows and newspaper reports have been painful. The not knowing what happened to her grandchild has been the worst. Kim is allright with the decision to close her store, a place that has been such a huge part of her life. She said her customers have been very understanding about her sketchy hours the last years, and very, very supportive. Now she is working through selling her vast inventory, beginning at the half price sale of everything. Later there will be bookshelves for sale, and lots of them. Stop in to this iconic downtown Rockford store and find some very good deals on very good reads. You will also find a very impressive woman who has done a lot and been through a lot, but always has been a fighter. You are sure to have plenty to browse through, whatever your favorite genre or author. Better hurry, though, some books, Kim admits, are too precious to part with and are going home with her.